Nearly 200 people testified before the Legislature’s Joint Committee on Finance at a public hearing Monday in River Falls. Common themes included calls to expand the state’s Medicaid program and increase funding for public schools around the state. 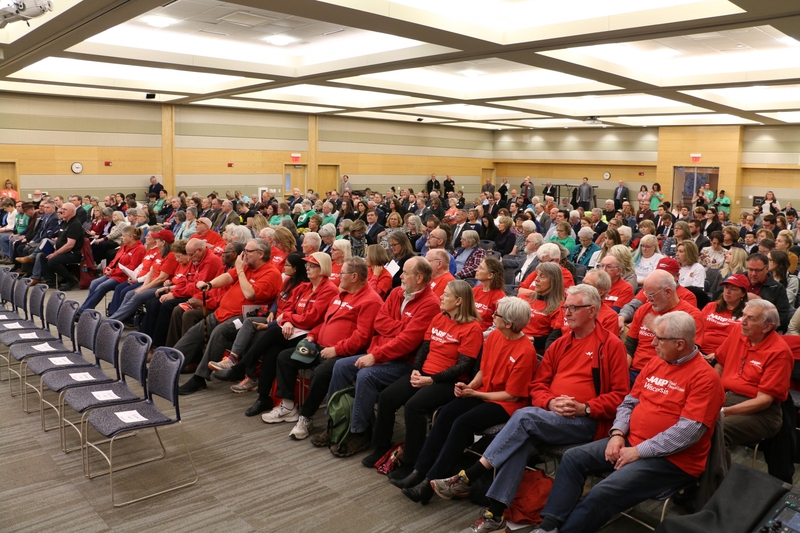 The Riverview Ballroom at the University of Wisconsin-River Falls student center was near capacity as residents from western Wisconsin and around the state waited for their two minutes to urge action on Gov. Tony Evers' proposed $83.4 billion two-year budget. The most common theme of the day was Evers' proposal to expand the Medicaid program known as BadgerCare. Don Dunphy told committee members how he and his wife didn't have health insurance when their first child was born and how he worried he wouldn't be able to pay the bills if something went wrong. Dunphy said the birth was routine and he now has health insurance, but he worries about his neighbors and friends that don't. "These folks are one illness away from bankruptcy and I would ask that the Legislature accept the federal dollars to expand BadgerCare through the Affordable Care Act," said Dunphy. "It would mean that 80,000 more Wisconsinites would be able to afford health insurance." Also among those testifying were a number of school board members and school district superintendents urging lawmakers to approve an increase in funding for K-12 schools included in Evers’ state budget proposal. River Falls School District Superintendent Jamie Benson, along with others, zeroed in on Evers’ plan to increase special education funding for school districts by $600 million over the next two years. Benson said currently his district is forced to transfer millions of dollars from other programs in order to fund special education needs. "We spend $4.7 million on special ed services, and we proudly love and serve all of our students," said Benson. "But we have to transfer $3 million from fund 10 over to fund 27 to educate our special needs students and it removes that funding from other important areas that exist in our district." Benson and other district leaders also urged lawmakers to lift caps on how much revenue schools can raise and allow districts to hire retired teachers to address a workforce shortage in education. Republican lawmakers, including members of the Joint Finance Committee, have said a $600 million increase in special education funding isn’t likely citing concerns about increasing taxes. Chancellors from western Wisconsin universities also gave testimony. UW-River Falls Chancellor Dean Van Galen urged lawmakers to keep additional funding for capital projects including a planned $113 million Science and Technology Innovation Center. The new building would replace science buildings on campus built in 1966 and 1977. Van Galen told committee members around 31 percent of all degrees earned at UW-River Falls are in the fields of science and technology but their infrastructure doesn’t adequately support students. "Infrastructure issues abound such as outdated, barely safe, electrical and ventilation systems," Van Galen said. "The layout does not does not support interactive teaching and learning, and we are sorely lacking a space for undergraduate research." Van Galen said between 2013 and 2016 the amount of new freshmen enrolling in science-related fields grew by 40 percent but he’s heard complaints about lab space from students. "Our students regularly tell us that our lab facilities are inferior to those they experience in high school, and employers tell us that our graduates who they hire have facilities here that fall short of what they see in business and industry," said Van Galen. While Evers included 82 building and renovation projects worth $2.5 billion dollars in his capital budget, Republicans on the state building commission rejected every single project. The committee will hold one more public hearing on the budget in Green Bay from 10 a.m. to 5 p.m. on April 24.